ARIK Airlines has blamed the Federal Airports Authority of Nigeria (FAAN) for the incident involving one of its aeroplanes that hit a Nigeria Air Force (NAF) aircraft at Jos airport last Saturday. 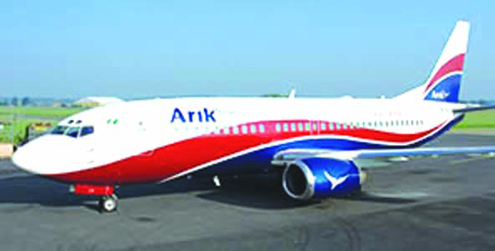 Arik’s Managing Director, Chris Ndulue, blamed the incident “partly on the apron markings of the airport, which had not been done to suit modern aircraft’s wing-span”. His words: “The markings on the tarmac of the Jos Airport are old markings, which did not take into cognizance the use of bigger aircraft like Boeing 737-700 or 737-800 which we have in our fleet and are capable of misleading pilots during taxiing. We hope this incident will make FAAN to re-do those markings”. A team of Arik officials comprising the Chairman, Sir Joseph Arumemi-Ikhide; Ndulue; the Chief Pilot, Captain Adetokunbo Adekunbi and Safety Manager, Captain Jide Bakare, were in Jos yesterday to assess the damage caused by the incident. The Nigerian Civil Aviation Authority (NCAA) was also in the team that visited Jos. An Arik Boeing 737-700 aircraft marked 5N MJI and a NAF C-130 (NAF 917) aircraft were involved in an incident on the tarmac of Yakubu Gowon Airport, Heipang, Jos. According to Ndulue, the Arik aircraft on a scheduled flight from Jos to Lagos, brushed the wing of the parked NAF aircraft while taxiing, causing minor damages to the wings of both aircraft. The tank 1 wing tip of the NAF C-130, as well as the left winglet of the Arik Boeing 737-700 Next Generation (NG) aircraft, were damaged. He said contrary to reports in the media, the incident did not lead to the gushing out of fuel from the damaged area of the Boeing 737-700 as the aircraft’s tanks are well protected. He also debunked the claim that another of the airline’s aircraft had an incident in Abuja on Saturday. Meanwhile, a businessman, Dr. Denis Chikere, has sued Arik Air Limited for N5 million as damages for the loss of his luggage (a black box) containing his personal effects and other valuables. 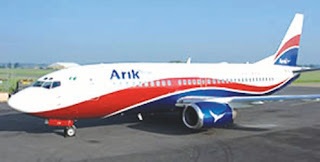 According to the plaintiff in his suit pending before an Abuja High Court, he had purchased an Arik ticket with number 72542007267385 at Asaba Airport for a 10 African meridian flight to Abuja.